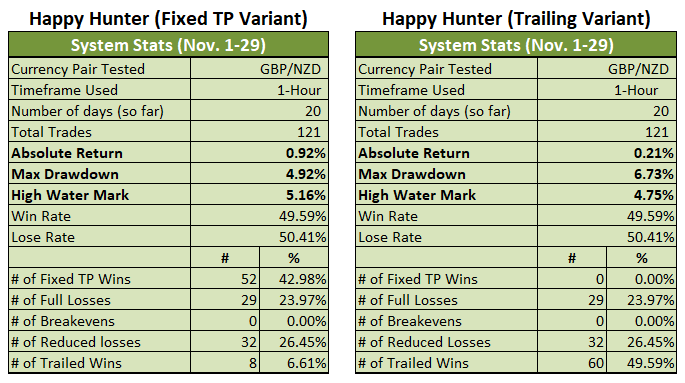 Another day, another update for the Happy Hunter Trading System! So, how did the two Variants fare during the most recent hunt? 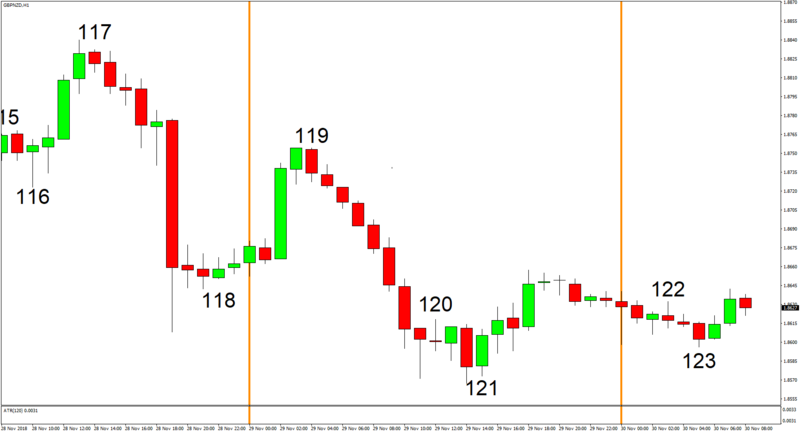 Only three trades were triggered on November 28. And unfortunately, two of those three trades were losers and the gains from the one winner were just not enough to offset the losses. The Trailing Variant was able to ride the downtrend during the first half of the day, though, so it only suffered a very light scratch. However, the Trailing Variant is just barely in positive territory with a 0.21% gain for the month (+0.23%). 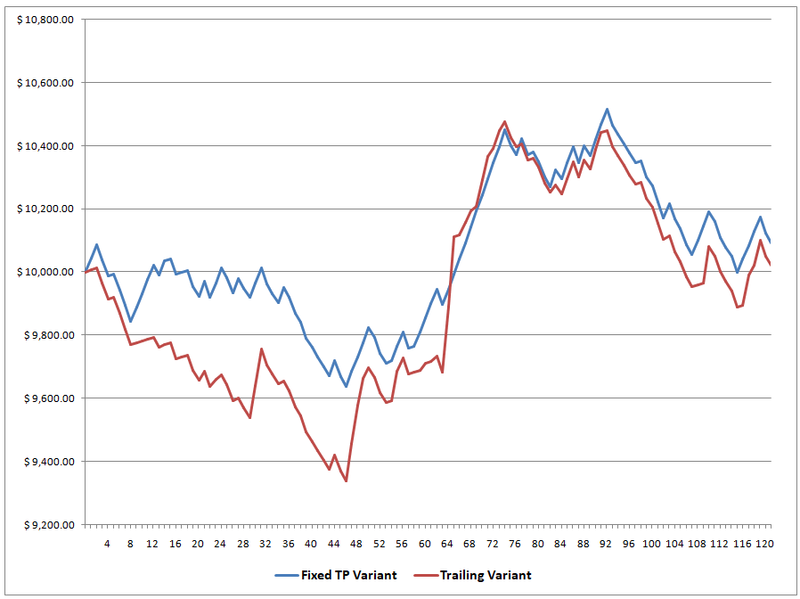 As for the Fixed TP Variant, well, it suffered a bigger loss and is now only up by 0.92% for the month (+1.29% previous). Anyhow, you can check out the details by clicking on the relevant jump links below. By the way, if you’re a first-time reader and have no idea what this is all about, then just know that I’m forward testing a purely mechanical trading system. And if you find that interesting, then you may wanna click on the links below to read about and understand the rules of the system. 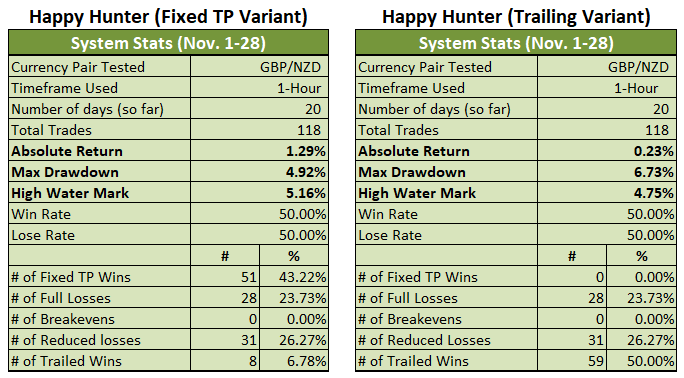 By the way, if you want to review how the system performed in October, then you can do that by clicking on the link below. And if you need to check out how the system fared in the previous weeks, then go ahead and click on the links below. Okay, that’s all for now. And as always, I enjoy your feedback, so if you have any questions, or if you found a possible error somewhere, or if you just want to say “hi,” then don’t be shy and write a comment down below!